What does wildlife in a one hundred year old man-made pond has to do with local fruit? The tangible link would be that water from the pond I am going to talk about could be used to help young fruit trees and bushes to survive their first years in hot summer in this 5000 square meter park, if the story was about replanting trees in this old orchard. Yet it is an other story I am going to tell, that of the renovation of the pond. The owner wanted to do well after the creation of this decorative feature by his grandfather at the beginning of the 1900 ies, but he didn’t realise he would destroy the biological balance of this ecosystem built over a century by doing it the way he did. Unfortunately he asked the builders to “clean”, remove the mud and silt from the bottom of the pond, and we are now left with a place that has lost most of its wildlife and where water becomes cloudy when the weather is hot. It is a bit like a well-maintained orchard or garden, it takes time for nature to take control and regulate itself with some human help to make it a productive place where pests don’t reproduce too much. This I feel had been achieved in this pond, where we had crystal clear waters all year-long. The moral of the story? Know nature. 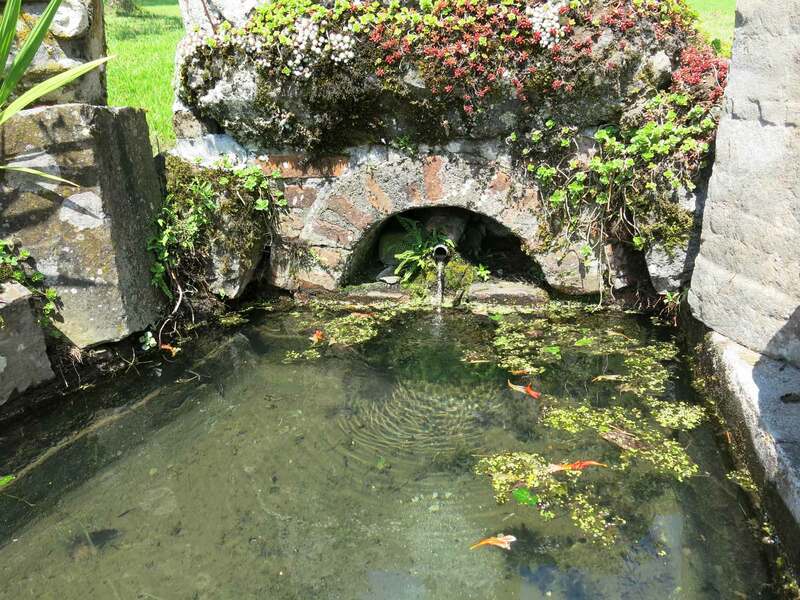 Four cubic meters of water in this pond made of stone and concrete, renovated last week. Photo 28 July. 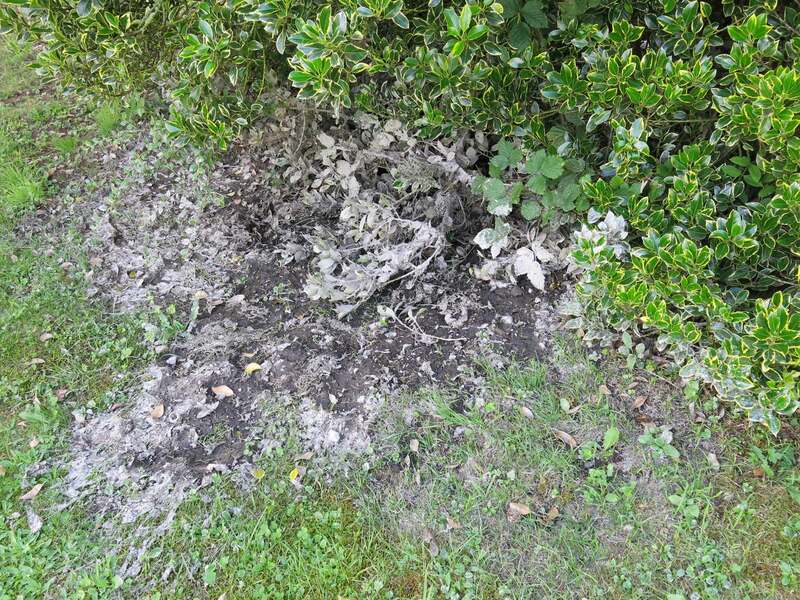 Unfortunately the silt accumulated over the years was removed from the pond and thrown away with all the micro-organisms and animals it contained. 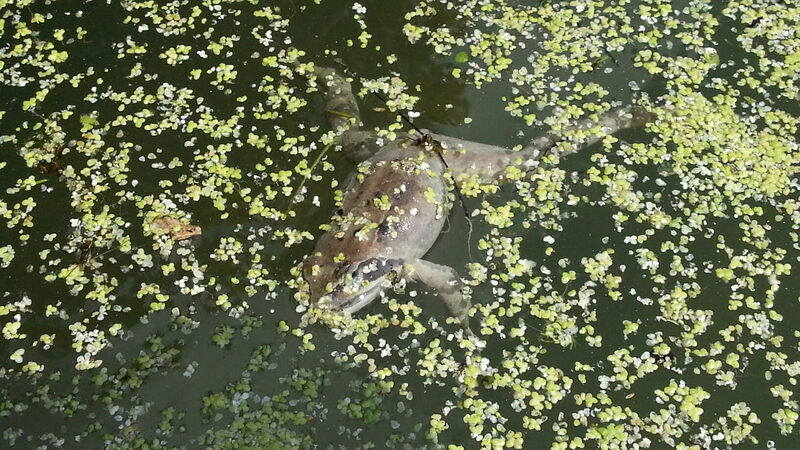 We have found twelve dead frogs in the pond since. Very little of the wildlife was saved. 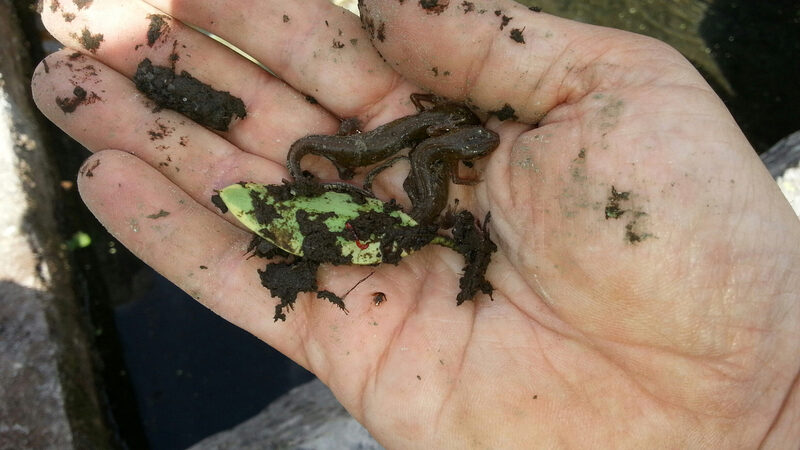 These two salamanders were found sticking together in the drying mud under the holly tree from picture 2. Top left: caddisfly larva. On the leaf: a very small bloodworm. They are back in the pond now. Insects will reproduce and frogs will come back, leaves will fall from the trees and form new layers of mud and silt, bloodworms of all kinds and water snails will reappear. Yet it will take years before the pond ecosystem is balanced again, enabling the water to stay clear during the hottest summer as it used to. 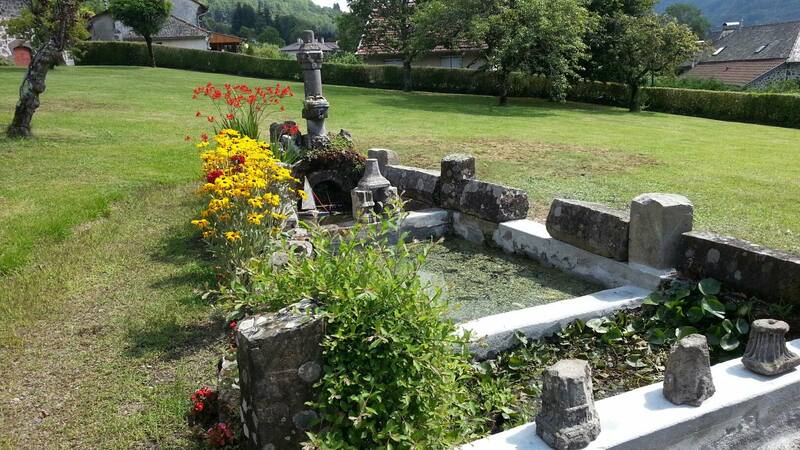 This entry was posted in Stories and tagged France, Saint-Simon by Les Jardins d'ici. Bookmark the permalink. Unfortunately reality is worse than I thought: water is getting cloudy even in the first pond where the spring flows. Photo 4 August. Back to clear waters yesterday. Fresh weather helps? There will be good and bad days, and years I guess, until nature strikes a new balance. It will hopefully happen sooner rather than later.